When it comes to logo design, many designers deliver multiple concepts to the client in order to let them to pick their favorite one. Many even have different concept packages and an allotment of revisions. But what is the purpose of these multiple concepts? On what merit are revisions based? I submit to you, if a designer has arrived at two concepts, his work is not done. Design is an iterative process. You start with many ideas and you continually refine. You dismiss the less effective ideas and distill down to the one that best serves the project goals. It is the designer’s job to establish a process that concludes with the most effective concept. If a designer cannot determine which of two remaining concepts most effectively serves the project goals, then they are not to the point where they should be taking on clients. If you believe that a professional designs a logo for their client, you are mistaken. A professional designs for the client’s customer. You do not design for your client. It is not your job to serve the preferential whim of your client. This preferential whim is exactly what is being served when you deliver multiple concepts. The client picks their favorite. Their subjective preference. But again, who is the logo for? The client’s customer. It does no good for a client to love a logo that is not effective with their audience or does not meet their project goals. This is precisely what I tell my potential clients. I’m not afraid to be honest and up front with them. In fact, it’s a requirement that I am as straightforward in the preliminary stages if I am to set the right precedent for the relationship. Options are a disservice to the client. Much like a doctor or mechanic who suggests a myriad of possible operations—I’d much rather their single, professional recommendation. The best solution. The most ideal choice based on their extensive experience. That is where I receive the greatest value. I conclude by telling the potential client that if they are interested in having someone with experience dedicate themselves towards crafting something that will be effective for their needs, we will be an excellent fit. When you simply deliver multiple options, you are acting as a technician. The focus is on your time and your output. You are an expense, and you are a commodity. When you provide a solution, you are acting as a professional. The focus is on your results and the value you create. You are an investment, and you are worth paying relative to the value you create. It is imperative that you set the groundwork for a successful project at the very beginning. This is done through your communication during the preliminary stages. You must take care to very clearly establish what you and your client are each responsible for. These roles should be defined in your contract and personally communicated to the client. The designer is responsible for design. This includes any and all design decisions. 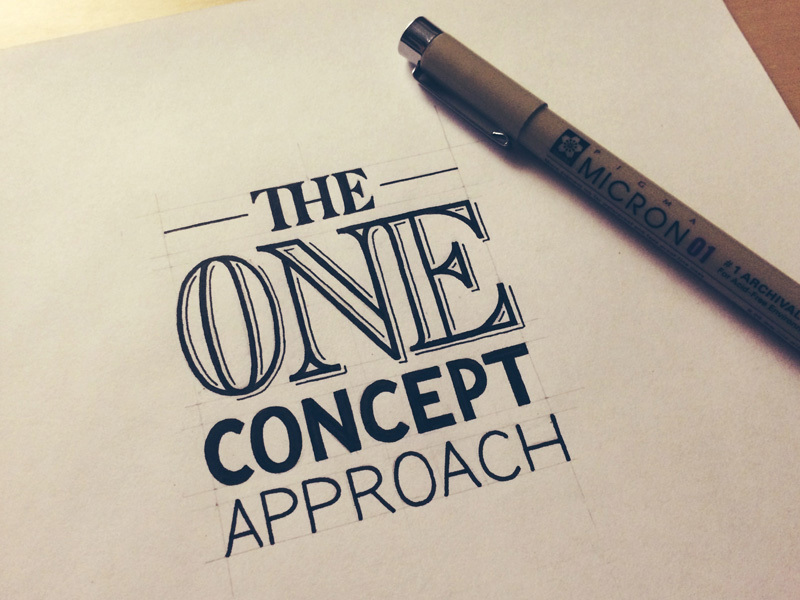 Selecting the most effective concept is a design decision—one that you should not subject to the client. Your job is design, and as a professional you do not subject others to decisions that pertain to your job. Your general process is an overview of how you work. It should contain all stages and steps that are common in every type of project you do. A general process can and should be placed on your website where it is publicly viewable by potential clients. This process is something you create on a client-by-client basis. You provide this specific overview to the client at the onset of the project. The General Process publicly displayed on your website lets a client see how you work. This gives them an idea of what they can expect. Your Project-Specific Process takes this a step further and customizes the General Process to fit your current client’s specific project. This goes a long way in preventing future problems. Being transparent and communicative about how you work and when the client can expect things is how you build trust. This trust is necessary to facilitate the type of relationship that will allow you to deliver one, single, most effective concept. As a way of further establishing credibility and building trust, use Case Studies to show how you work. Case Studies work to provide a multifaceted look at your process. Yes, the client can read your General Process, but the more unique Case Studies you display, the more well-rounded the client’s idea of how you work. Yet again, this is a very important part of building that trust. Once the relational groundwork has been laid, expectations have been set, roadmap has been laid out, contract has been signed, and you have been paid, you are now ready to begin the design process. At this point, the client knows that you will be delivering a single concept that most effectively meets their project goals because you have thoroughly communicated this to them in order to make it to this stage. It’s time to refine, refine, refine. You start with many ideas and you hone it down. This is the only time are ever multiple concepts: within your own process. Your output should only ever be a single solution. This comes from a process that refines a number of explored concepts down to the very best, most effective form. You must possess the design competence to be able to determine this based on the project criteria else you have no business taking on clients. There are no revisions except within your own process: and there should be many. This is no overnight process. You should be repeatedly taking breaks and returning the next day with fresh eyes and reevaluating. Look at your concept in different contexts and in different light. Assess the concept’s effectiveness at different scales, refine your vectors, print out the logo and look at it on paper, view it on different screens and different mediums. Even after I’ve reached what I believe to be a candidate for final concept, I typically spend about a week on the refining process. This is arguably one of the most important steps of the whole process. You should make no small deal about this presentation. This is the result of weeks of research, work, and testing, and your documentation of that process should be thorough and exhaustive. Let’s first talk about what you DO NOT do: You never simply send over a design and say “What do you think?” That is the mark of a novice. A professional walks the client through the objective design decisions that were made and shows the client how they work to serve their project goals. This means you should be documenting your process as you go. This typically takes the form of things like taking photographs of preliminary sketches and iterations and explaining why you pursued one direction over the other. Every design decision should be objective. Every serif, every swash, every icon, every illustration and shape should be purposeful. Explain it all in your presentation. Do you see how this is starting to come together? You laid the foundation for a successful project, you’ve done your best work—the work you specialize in—and now you get to show the client the value that they receive as a result. What does this kind of presentation look like? Here’s the fantastic part: because you’re putting so much effort into documenting your process and explaining thoroughly, the presentation you send to the client works double as a Case Study that you can display on your site. Typically there are only a few minor changes you’ll need to make to such an exhaustive presentation for it to function as a great Case Study. Show your work and how you focused on those goals while demonstrating mindfulness of the constraints. Now that you’ve sent the presentation, what’s next? Well you are the designer, which means you should be designing the call to action. It should be very clear what is needed from the client. Let’s once again restate what you DO NOT do: You never conclude a design presentation with “What do you think?” That is the mark of a novice. You as the professional have thoroughly explained your process and shown the value of the result. This is the service you provide. There are no arbitrary revisions, there are no subjective requests for changes, so do not conclude by soliciting them. You have positioned your professional service as one of providing an effective solution, and your client has demonstrated that they are on board with that—it’s why you took them on. The final step is payment. This is the call to action. The presentation contains raster process images. At the conclusion of the presentation, you inform the client that the vector deliverables will be sent upon receipt of the final payment. No doubt you have some questions right now. I’m aware that these are very challenging concepts I’m presenting. They require an uncompromising approach and without the necessary understanding of design professionalism they can not be put into action. Chances are, these ideas are new to you and you’re still wondering about some things and are looking for answers. The good news: this is exactly what my podcast addresses. I anticipated that this article would spur many questions. For this reason just yesterday, I recorded an accompanying episode of my podcast to go over The One Concept Approach and provide even further context. The podcast was broadcast live, and I answered questions from the listeners in the chat as well as from people on twitter.